The Alvin Tech-Matic Deluxe Metal Lead Holder is designed for heavy-duty applications. It features a tough, durable all-metal barrel that comes with a rough finger grip. This knurled grip provides friction to resist slipping while using this lead holder. With a spring-loaded lead feed, a 1/8-inch positive auto-control lead advance can be achieved with every click of the cap. 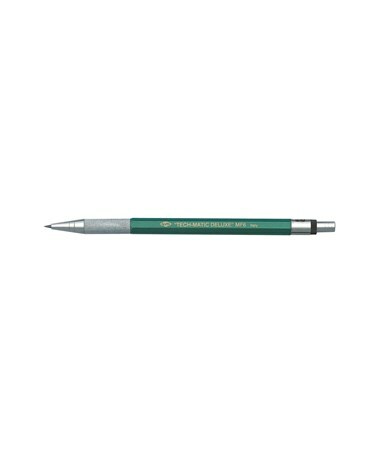 This metal lead holder is equipped with a rotating lead degree window that can be adjusted to indicate the degree of the lead inside. This allows easy and quick recognition of which holder to use. It also includes a built-in mini lead pointer inside its cap. Ready-to-use, it is loaded with one lead. The Alvin Tech-Matic Deluxe Metal Lead Holder holds two-millimeter leads. It is blister-carded and is sold individually or in a pack of 24. The 24-pack offers an optional 6"W x 5¼"L x 10¼"H acrylic peg hook counter display. The Alvin Tech-Matic Deluxe Metal Lead Holder comes in two different packages to suit various needs. Please select your preference from the drop-down menu above.